Advances in cosmetic dentistry now allow us to not only enhance and rejuvenate our skin and facial features but also to improve the appearance of our teeth and in particular, to overcome any problems due to ageing, such as missing teeth or yellowing teeth. Revolutionary new techniques in cosmetic dentistry now enable change the colour, shape and size of your teeth – and enable you to rejuvenate your smile and harmonise your teeth with the rest of your face, to achieve a fresher, more youthful look. Perhaps more than anything else, most people long for sparkling white teeth. However, due to dietary habits (such as consuming large amounts of caffeine and red wine), lifestyle habits (such as smoking) and general ageing, teeth will gradually discolour. Part of the reason for this is that the enamel covering the surface of the teeth is never replaced and it gradually wears thinner and thinner with age, revealing the dentine layer beneath. Meanwhile, this dentine layer is repaired by the body but becomes darker with age, leading to yellowing teeth. The proliferation of teeth whitening or ‘bleaching’ products on the market can offer help for all lifestyles and budgets – however, while some of the over-the-counter products may prove effective, if your teeth are seriously discoloured or you wish to ensure that the job is done properly, it may be worthwhile booking in with a cosmetic dentist for a professional teeth whitening treatment. You may have teeth that have micro-cracks which could lead to a “striped appearance” if the teeth whitening treatment does not take this into account. Alternatively, if you have crowns or veneers, they may not respond to the bleaching treatment like normal teeth. Time and ageing often results in teeth that are weakened and not structurally sound – perhaps due to lost fillings, decay behind a filling, root canals, improper bites, teeth grinding and enamel cracking. All of these can lead to large-scale defects on the surface of teeth. If this is the case – and the root system is still healthy – then it is possible to improve the appearance of the teeth by the use of a form of cosmetic dentistry called crowns. Dental crowns provide a covering over the entire visible surface of the tooth and help to strengthen and stabilise the tooth, as well as improve its durability. Several types of crowns are available, in a variety of materials such as porcelain, ceramic, bonded metal, gold, procera and zirconium – which will affect the cost. For example, metal crowns are cheaper but they are less natural and attractive looking and can even show up grey around the gum area. Conversely, ceramic or procera crowns are very natural-looking and attractive but can be very expensive. Veneers also cover the tooth – in fact, it is similar to a false fingernail. As an option in cosmetic dentistry, they are very effective for covering chipped, broken, mishappen or discoloured teeth. They can also help to re-align teeth or close gaps. Veneers are very strong and also have a translucent appearance, which help to make them look very similar to real teeth. However, veneers may not be suitable for everyone. The procedure requires a small reduction in natural tooth plus they will probably need to be renewed 3 to 5 times over the course of a lifetime, as the natural tooth underneath the veneer darkens and the gums contours change with ageing. In addition, veneers will need to have a lifetime commitment of care, just like natural teeth (eg. flossing, brushing, regular dentist visits) and do not have the robustness of many other cosmetic dentistry products. Bonding is a form of cosmetic dentistry used to improve the appearance of the front teeth, either through repairing, reshaping or restoring. It is a good technique because it enables the dentist to reshape a tooth without resorting to drilling or damaging – and possibly destroying - the tooth structure. 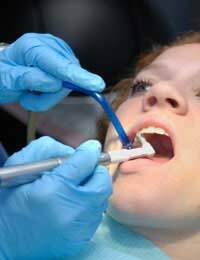 Bonding is done by applying a white filling material to the tooth and then “setting” this using high intensity light. This cosmetic dentistry procedure usually takes about 45 minutes per tooth so it can be a lengthy procedure but it is a good alternative to crowns or veneers for reshaping teeth or closing gaps. Bonding will usually last up to 5 years, although it needs to be checked regularly to ensure that its colour and strength still matches with the gum contouring, as the latter will continue to change with natural ageing. For those with issues in the root of the tooth, teeth implants provide a good solution. This involves using a titanium screw to replace the root of the tooth and then the tooth is restored, so that the patient is able to eat normally again with comfort and ease. However, it is important to have good bone quality for the implants to be able to work effectively. Simple implants can be done without any bone augmentation or sinus problems – in cases that are more complex, however, implants may be linked with a full mouth restoration or soft tissue complications and in these cases, it may be worth having the attentions of a dental specialist experienced in implants.